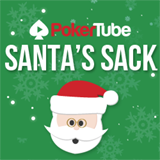 Next time you watch your favorite poker videos at PokerTube.com you could be in line for an added bonus thanks to the media hub's new Santa's Sack promotion. Just sign up to an online poker site through PokerTube and you get a go on their Christmas slot machine. What then? Well if you get lucky then you can win one of a selection of great prizes, from free spins to cold hard cash. There are goodies on offer too: PokerTube t-shirts or, for the really fortunate few, the exclusive 2015 calendar featuring the beautiful PokerTube host Natasha Sandhu. You can only win a copy by spinning the slot machine, so it really is a special prize for those lucky enough to win. With 12 different poker sites to choose from in the Santa's Sack promotion, you might not have to wait until Christmas morning to open your first gift.